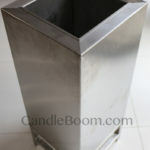 Eco-Friendly Candle Carving Wax Melter. Digitally controlled precise heating from 5-100°C. 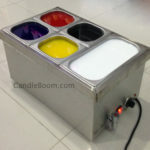 Equipment has 10 containers for colored wax to volume > 4 liters each. Plugs into 220v or 110v outlet. 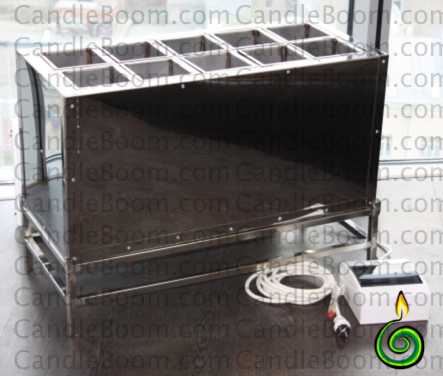 Candle Carving Wax Melter Hobby 10 – semi-professional equipment for production of candle carved candles The equipment is made of stainless steel for the original development of the Ural candle factory. 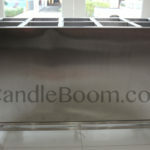 It allows you to make carved candles at home. 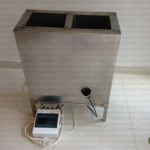 It equipped with a heating element, an electronic temperature control unit, drain valve. It has 10 containers of colored wax. It connects to the network 220v, 1,5 kW. 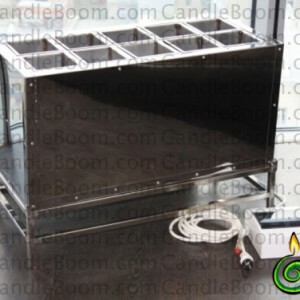 Attached to the machine tool set “Begin master candle”: bamboo sticks to stir the wax knife for cutting candle shaped knife for cutting patterns, round knife, a hook for holding candles. The device is equipped with the instruction manual. For all customers a free technical support.